There were two of us at school who got Cockney Rebel way before the rest. For a time I thought I was alone, until one afternoon I spotted my enantiomer carrying a copy of The Human Menagerie album. I had the Psychomodo at home so we swopped, then traded our interpretations of all those wonderfully quirky tunes: Death Trip, Tumbling Down, My Only Vice, Bed in the Corner, Sebastian and so on. Although we both agreed Cavaliers was just nonsense. My own personal fave was Ritz which, although I found Harley’s lyric unfathomable, bore me away to strange places on its wave of strumming guitars and soaring violin solo. 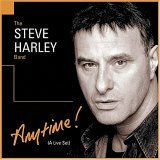 When Steve Harley re-jigged the Cockney Rebel line-up sometime around late 1974 and came up with his pension-fund hit Make Me Smile, us two briefly basked in a little bit of reflected glory, but this didn’t last. Not that we minded, for it swiftly became clear that in his (perfectly understandable) quest to tap into a rather more mainstream (and hence more lucrative) audience, Harley had jettisoned many of the elements which had made early Cockney Rebel so beguiling. Jean-Paul Crocker’s violin had been replaced by electric guitar, and Milton Reame-James’ eccentric organ by rather more sedate electric piano. Plus the songs had been replaced by what? Whiny self-important pseudo-epics like 49th parallel, Back to The Farm and It Wasn’t Me. And thus it came to pass Cockney Rebel and I parted company. Harley over the next few years, despite retaining a strong core following, degenerated into a figure of fun in the music press, as each studio recording was poorer than the last. He must have thought his luck had changed when in 1985, he was invited to perform the title role in Lloyd-Webber's The Phantom of the Opera (indeed enjoying a hit with the promotional single early in ‘86), but was (crushingly, I’m sure) dropped from the show just before rehearsals. Fast forward 17 years and the lad was out and about with his latest Cockney Rebel incarnation which, I was pleased to note, included a violinist. I also noted he appeared to have, somewhat suspiciously, rather more hair than he was photographed sporting back in the late Seventies. That being said, as wigs/transplants go it appeared one of the more successful examples of the breed. Steve’s voice was all his own though, and was on good form this particular evening. He was also, I discovered, a rather witty and personable raconteur, entertaining us all with lengthy between songs banter. At one point during onesuch, he was asked by an audience member why he did not release albums any more. His reply of “Cause you bastards won’t buy them” perhaps contained a touch more truth than made for comfortable listening. But no-one seemed offended. Highlights for me were Bed in The Corner/Sling It, Love Compared to You and the delightfully silly Mr Soft. I had to leave this one sharp so missed the encores where I assume Make Me Smile was aired. Not that I missed it too much; the REAL Cockney Rebel had ended with the departure of Crocker, Reame-James and original bassist Paul Jeffreys as far as I was concerned.